This was a lovely park about 45 mins from entrance to Sequoia National Park. The setting was quiet and country which we really enjoyed. The wifi was decent as well as Verizon service (not 100% but good enough). Bathrooms were clean. Nice dog park. I also enjoyed spending time by the pool. Most sites looked like pull thru's. There were picnic tables for each site which were not too cramped. Overall, we enjoyed our stay and would recommend it those visiting Sequoia in larger rigs (length restrictions as you get closer to the park). Very friendly staff stayed after closing to help us get a nice site. Very level sites but some are a little narrow. We didn’t have to unhook out tow vehicle. The enclosed dog park was nice and the pool was even better. We would stay here again. We parked here in order to visit Sequoia National Park. It is located about 17 miles from the park entrance. There are campgrounds closer to the park entrance but I have no experience with them. This campground has gravel driveways and site pads. There is a grass strip and small fence between sites. We had a pull through site with full hookup, 50 amp electric. The park is kept clean and seems well maintained. Also, the bathrooms are very clean. They have WiFi but it is only available around the office. I did try to use it but it seemed hopelessly slow. They have a clubhouse with TV, pool table, games, etc. We paid $49.50 per night with Good Sam discount. I stayed at Lemon Cove Village RV Park in Sept 2017. This is a quiet, clean RV park with some shade on most of the sites and it is a Sequoia Shuttle Stop to access the park without driving. The restrooms and showers were clean and in good repair. It’s a little on the pricey side ($48/nite) for basic hook ups (no cable or Wi-Fi at the sites) I planned to use this park as a stop off before towing my RV into Sequoia National Park. I made reservations at 5pm the day before by phone and spoke to a courteous representative. She took my credit card information to “hold” the site. I then saw that there are length restrictions on Hwy 198 and I wouldn’t be able to access the park as planned, I had to use the main entrance on Hwy 180 to the north (Check the National Park Service website for road restrictions). I called back 40 minutes later to cancel my reservation and was refused citing their cancellation policy requiring 24 hour notice or forfeiture of the entire nightly rate—no exceptions. 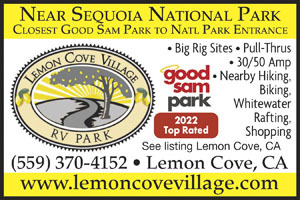 Lemon Cove Village is conveniently located near the park but if you plan to tow an RV into the park, you should use Hwy 180 east of Fresno. My rating is a 2 because of the entire registration process. The advertised rate posted on the internet was not immediately honored (a rate increase apparently went into effect earlier that day) and the refusal to be flexible with their cancelation policy considering the circumstances. Very clean park. The associates were very friendly. We enjoyed our stay. Stayed there two nights while visiting Sequoia and Kings Canyon. Gave me a site # when made reservation in Jan which was nice.. Did not use restrooms or showers. stayed in a 25 foot class c with car on tow dolly. pull thru site had plenty of room. Average park with OK amenities. The sites are gravel and many are not level. Take leveling boards with you. They have a decent bathroom and shower area that is old but clean, dog park, laundry room and a small convenience store in the main office. The wifi only works very close to the office, but it works well when in range. The staff was very accommodating to us as we changed our reservation due to repairs on our RV. Sweet. 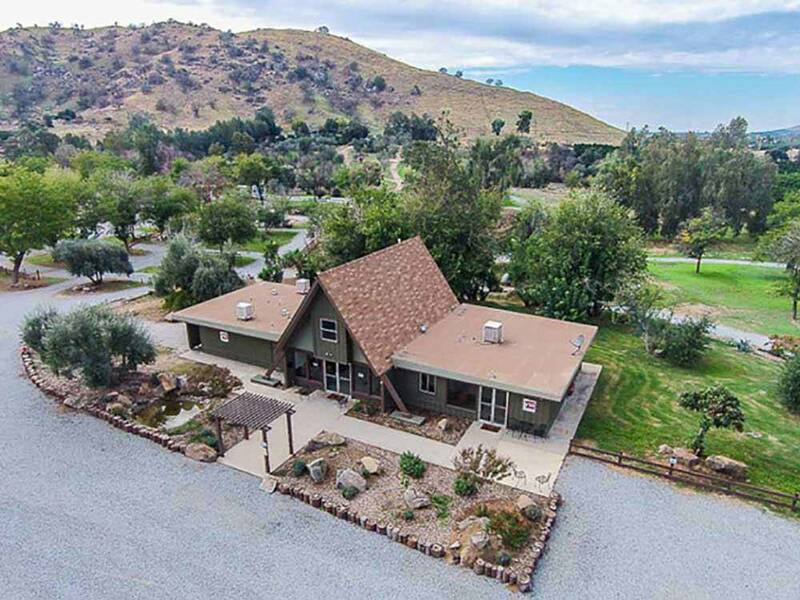 Lovingly cared for park with full hookups, partial hookups, dry camping, tenting. Level sites, many pull throughs. Very clean and nice bathhouses. On CA 198 on the way to Sequoia National Forest. Recreation room with pool table, book share, DVDs to borrow. Friendly folks. I moved my tiny home on wheels here on May 1st, and stayed until June 24th. Many improvements have been made to the property, and, as a result, the number of daily, weekly and monthly occupants has increased. The owners and hosts are extremely friendly, helpful and informative about the area, the national parks and recreational events. Located just ten miles east of Visalia, that town offers all the necessary shopping you will need. A much smaller town, Exeter, is located much closer, and is full of restaurants and shops. I highly recommend this site for solos, couples and families. The swimming pool offers a refreshing moment during the long hot summer days. Showers and restroom facilities are clean and tidy. Laundry facilities are also available. For the latest activities, search FaceBook for Lemon Cove Village Photos and other commentary are posted there regularly.